g. 2006-02-03 London protest - Hate slogans - No Arrests! 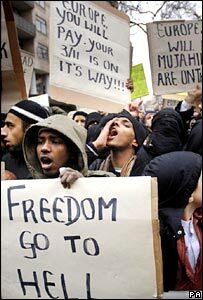 There has been widespread condemnation of a demonstration by Muslim protesters who threatened violence during a march. 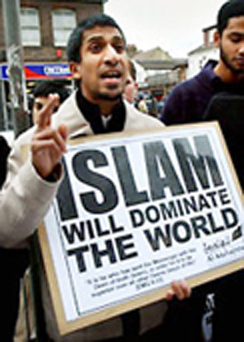 Shadow home secretary David Davis said some of the messages on the placards amounted to "incitement to murder". 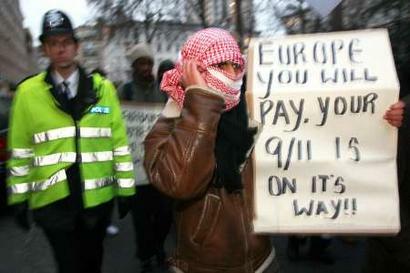 The protest on Friday in London over cartoons of the Prophet Muhammad saw slogans such as "7/7 is on its way". The police say they are studying photographs of those who attended and that arrests, if necessary, will be made at the "most appropriate time". Separate protests held on Saturday passed off peacefully. Police said more than 100 complaints had been received about the protests. Among the images which have sparked outcry is one of Muhammad with a bomb-shaped turban on his head. Newspapers in Spain, Italy, Germany and France reprinted the material. Mr Davis told the Sunday Telegraph that protesters should be dealt with firmly by police. 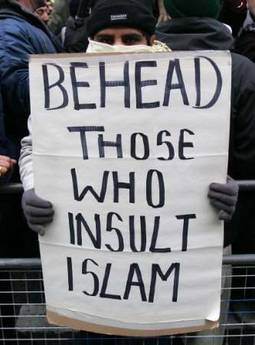 "Clearly, some of these placards are incitement to violence, and indeed incitement to murder - an extremely serious offence which the police must deal with and deal with quickly," he said. "Whatever your view on these cartoons, we have a tradition of freedom of speech in this country which has to be protected. "Certainly there can be no tolerance of incitement to murder." On Saturday, Asghar Bukhari, chairman of the Muslim Public Affairs Committee, said the demonstration in London on Friday should have been stopped by police because the group had been advocating violence. He said the protesters "did not represent British Muslims". Mr Bukhari told the BBC News website: "The placards and chants were disgraceful and disgusting, Muslims do not feel that way. "I condemn them without reservation, these people are less representative of Muslims than the BNP are of the British people." He said that Muslims were angry over satirical cartoons of the Prophet Muhammad published in European papers but it was "outrageous" for anyone to advocate extreme action or violence. "We believe it [the protest] should have been banned and the march stopped. "It's irrelevant whether it's Muslims causing hatred or anyone else - freedom of speech has to be responsible." 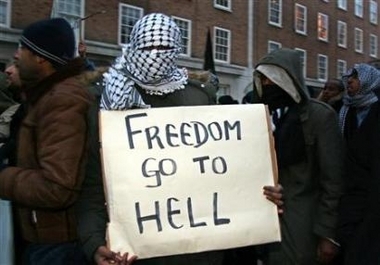 Meanwhile, Labour MP David Winnick called for people who waved threatening placards to be prosecuted. Mr Winnick, a member of the House of Commons Home Affairs Committee, said: "The cartoons were deeply offensive to hundreds of millions of Muslims. "But it is totally unacceptable that, on British soil, there should be thugs demonstrating for people to be beheaded and actually glorifying the atrocities of July 7. "It is to be hoped that prosecutions will follow very quickly indeed." He said those responsible who were temporarily in Britain should be deported, even it meant stripping them of permission previously given to remain in the country. The Walsall North MP added that the overwhelming majority of Muslims in Britain "have the same distaste as the rest of us about these thugs". "I hope it will be the last time we ever see such a demonstration, totally unacceptable to the Muslim community," he said. Police estimated Friday's crowd at between 500 and 700 and no arrests were made. 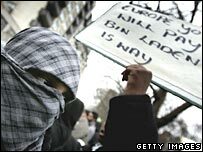 On Saturday more protesters, organised by the Hizb ut-Tahrir group, gathered outside the Danish embassy in London. It appeared that the rally was far more restrained than the one on Friday. Police later said two men had been arrested near the embassy during the protest. "They were arrested to prevent a breach of the peace, after a search by officers found leaflets including cartoons of the Prophet Mohammed," a Met spokeswoman said. Flanked by a forest of messages such as, "'Freedom' to insult", a speaker at Saturday's rally told the crowd they were demanding an end to "vilification". "If you want to debate and criticise then we are ready and we have been waiting, but we are not going to accept these images," he said. 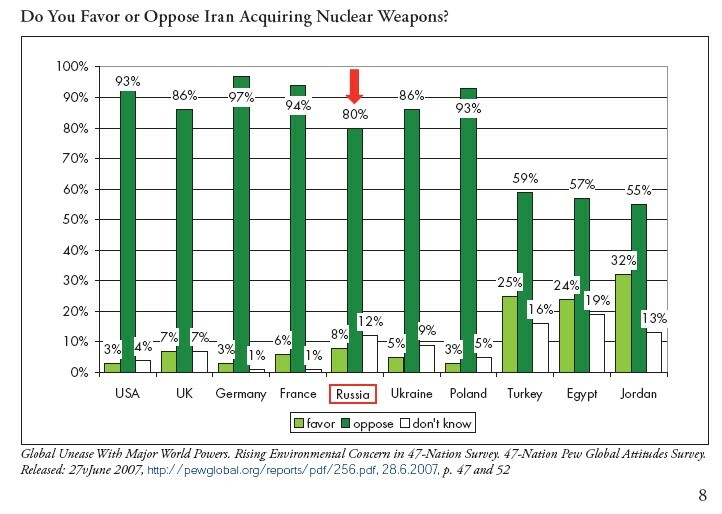 He called on "the governments of the Muslim world to completely sever all contact with European governments" until they had "controlled the media". Taji Mustafa, a spokesman for Hizb ut-Tahir, told BBC's Sunday AM that the posters, images shown by the television programme, had featured in Friday's protests which his group had "nothing to do with". "It had absolutely nothing to do with us, and we condemned those - they are not acceptable," he said. "And many Muslim groups have condemned Friday's protests and the images that were used there. "Our protest yesterday was very peaceful." He said the group advises Muslims "not to stoop to the level of those who want to resort to insults on the Prophet of Islam" and instead to engage in peaceful, responsible protests. And these protests should demand the media outlets who published the cartoons should apologise, retract them and pledge to "never to repeat this offence" in the future, he said. He added that it was an "issue of respect" between people.